Another quick post. Popcorn is so strange. But it’s really fun to draw. It’s another one of those things that I’ve never really looked at. That’s pretty sad considering all the handfuls of popcorn that I’ve shoved into my face in my lifetime. It’s totally sunny and 70 today. I can’t keep up with the weather. Earlier this week it was cold and rainy. I’m heading outside with my sketchbook and plan to bask like a turtle. Thanks everyone for stopping by and checking out my drawings! I’ll be posting new art soon. 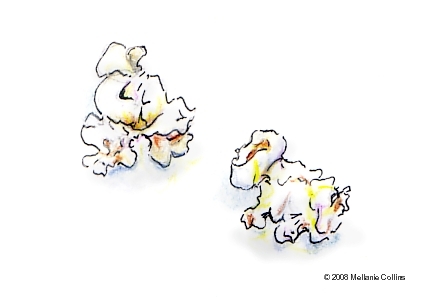 These two kernels of popcorn are so cute! Great sketch. What a great idea..nice doodling to do in front of the tv! at first, they looked like sheep to mean and then a poodle, and afterwards I could identify with many different shapes and forms. Very creative “doodling”! So glad you stopped by. I’ve been neglect about looking up some of my favorite blogs and yours is definitely one of my faves. I just added you to my Technorati faves. I love your drawings. You make me want to pick up a pencil again and do some drawing… but I’ve been into so many other things. Keep drawing. I love them! Thanks so much. Looking at popcorn really is like looking at clouds. You can have fun seeing what the shapes look like to you. looks good enough to eat Mellanie !! Well, I have taken quite a close look on your website and I must say that I find it extraordinarily interesting. The touches of colour are lovely – very delicate. 🙂 that’s why I like popping in here, your choice of subjects you draw. Oh I envy your weather, I am so looking forward to sunshine and getting out. Hi Mellanie! hope you’re doing great! I like this drawing very much. it is simple but i like the linework, the colours inside and the shadows. it’s a very nice illustration.